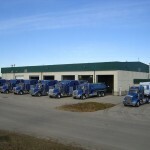 Superior Fire Control’s mobile fire suppression units consist of 6 diesel powered Kenworth and Peterbilt tractors. We have 1500 lbs of Purple “K” dry chem., a Waterous 2000 gpm fire pump, 1000 Imperial Gallons of water as well 150 gallons of AR-AFFF class B foam concentrate and our on board decontamination unit, with three shower heads, three eye wash stations and a drench hose. 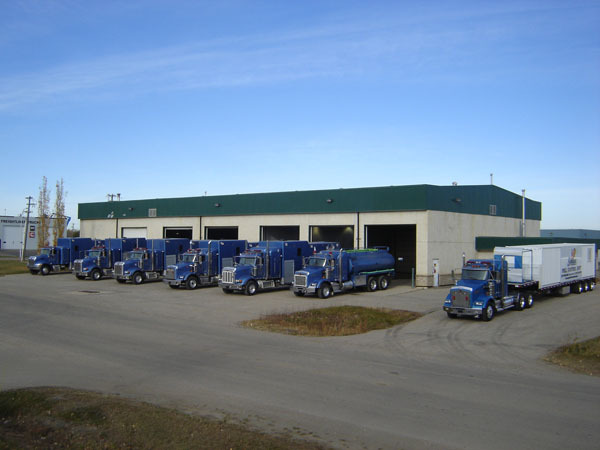 Our unit’s are equipped with a contaminated water recovery system eliminating any environmental issues that could arise due to waste water “dumping” on the ground. 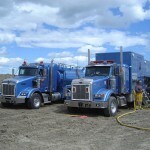 Superior Fire Control’s mobile shower/decontamination unit consist of diesel powered Peterbilt. The on board shower system has 3000 litres of fresh temperature controlled water, four shower heads complete with mid section eyewash stations and personnel drench hose. Also consists of a recovery bunk, clean linen and coveralls, so a person can be cleaned up and after medical attention may return to work (if given approval). 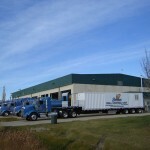 We have the contaminated water recovery system on this unit so no dumping contaminated water. 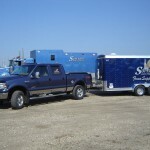 Superior Fire Control’s Standalone Shower trailer consists of 1800galons of potable water, 5 20gpm shower heads, 5 eye wash stations, 2 drench hoses. Also consists of a recovery bunk, clean linen and coveralls, so a person can be cleaned up and after medical attention may return to work (if given approval). 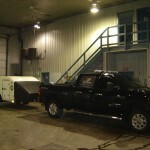 We have the contaminated water recovery system on this unit so no dumping contaminated water. 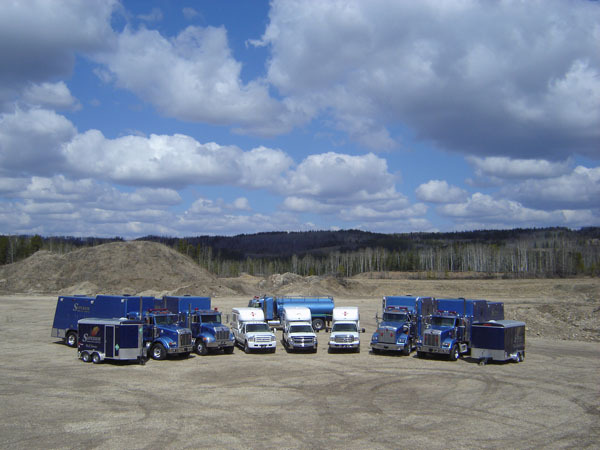 Superior Fire Control’s 20 MTCs consists of diesel power pickup trucks equipped with positive air engine shutdown’s and Horizon fibreglass treatment unit’s. 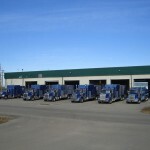 Our units meet and exceed transport Canada’s safety standards. Our treatment centres are climate controlled and are equipped with a spine board, basket stretcher, O2, burn blanket, eye wash station, Level #3 first aid kit, which meets or exceeds all OH&S standards. 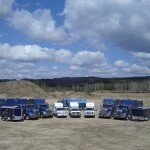 We have OFA3’s to EMT-A for staff with all current oilfield safety tickets. 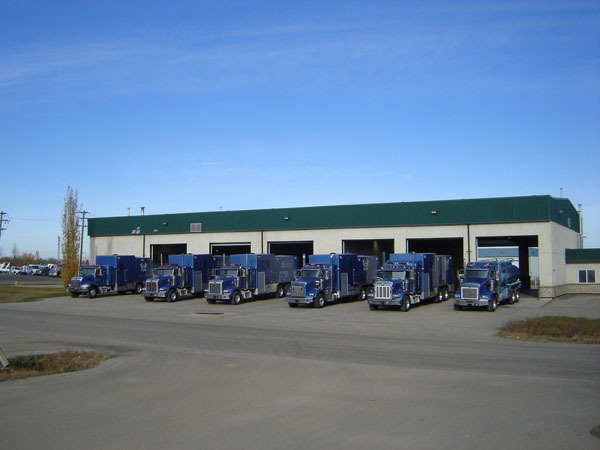 We are able to handle all of your medical needs on all industrial sites. All units are AED equipped. 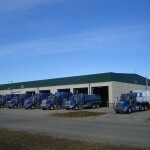 Superior Fire Control’s Water Truck consists of a tandem axle diesel powered Kenworth complete with positive air shutdown. The water pump is a 3” Bowie pump complete with 4” tank bypass valves (driver and curb side) which allows our fire control units the ability to receive water from the tanker at a higher volume than most tankers in the field. The water tank holds 16 m3 of potable water. 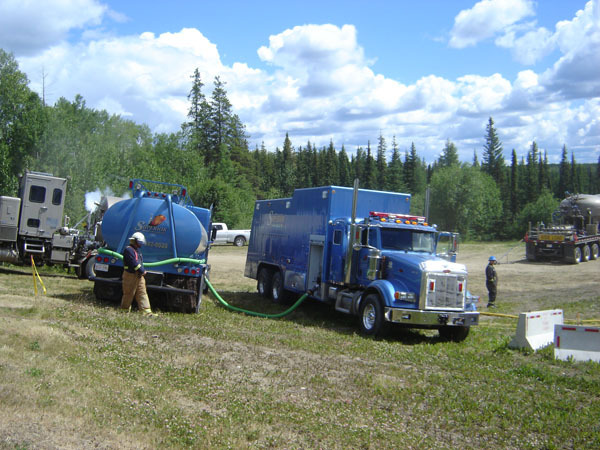 Our tanker comes equipped with 150’ of 1 ½” fire hose and nozzle to allow easy and rapid grass fire extinguishment and/or additional equipment cooling. Our units also carry a level #3 first aid kit, a dry chemical fire extinguisher and an SCBA for our operator. 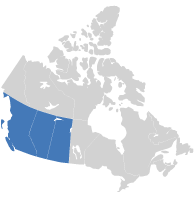 Operators are professionally trained firefighters. 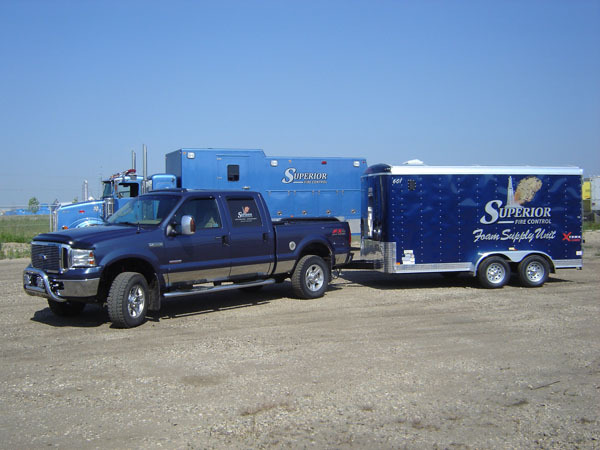 Superior Fire Control’s 17 breathing air trailers are fully stocked to supply air to (6) personnel on supplied air as well additional SCBA’s. 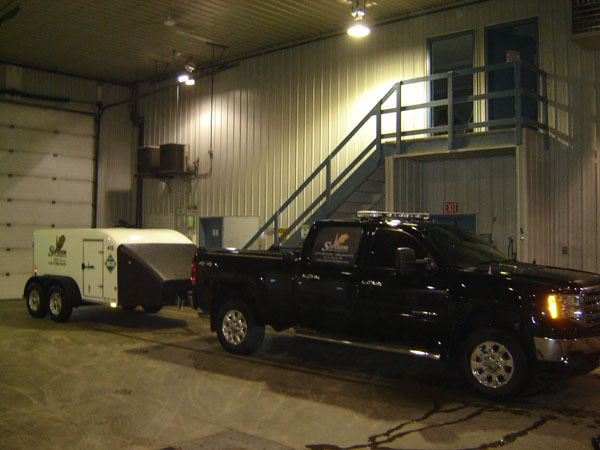 Our units come either high pressure (4500psi) or low pressure (2400psi) fully equipped with wind direction mast, folding stretcher, warning and egress signage, flare pistol with flares, 2 manifolds, burn blanket and first aid kit. 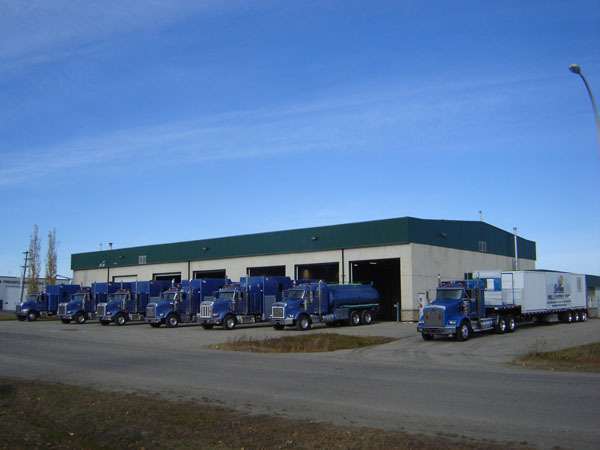 Superior uses Rae gas pumps and a selection of Rae tubes for H2S, SO2 and Co2. 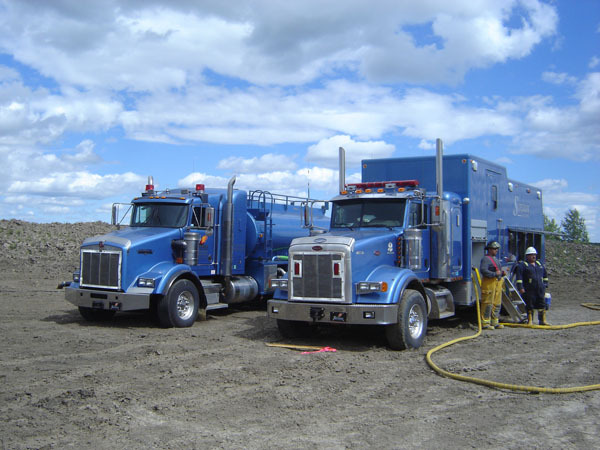 Additional equipment if requested: Rig Rat Systems, Ottis Gen11 remote gas monitoring systems, personal, Quad, and RKI Monitors, Road block kits, Ignition kits, Confined Space Kits. 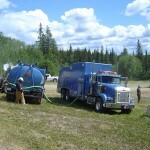 Superior Fire Control now offers the only mobile foam concentrate supply trailer in Northern Alberta/B.C Superior has incorporated a 500 gallon foam concentrate cell on board this trailer which will allow our fire control units to foam 75m3 of firefighting water at 3% for hydrocarbon fires plus an additional 23m3 from our on board foam concentrate which is part of our mobile fire suppression unit’s product package. On board also are additional large volume suction hoses, numerous lengths of 2 ½ discharge hose, 400 bbl tank fittings and tools. 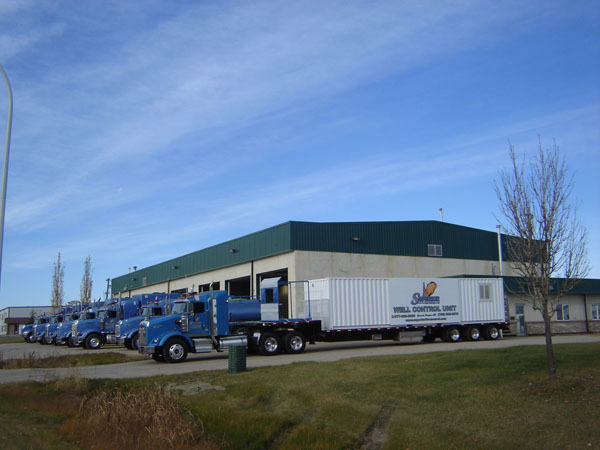 This trailer will allow up to (2) of Superiors fire Control units to tie in to this trailer simultaneously allowing Superior to handle the largest of production facility fires that could arise.